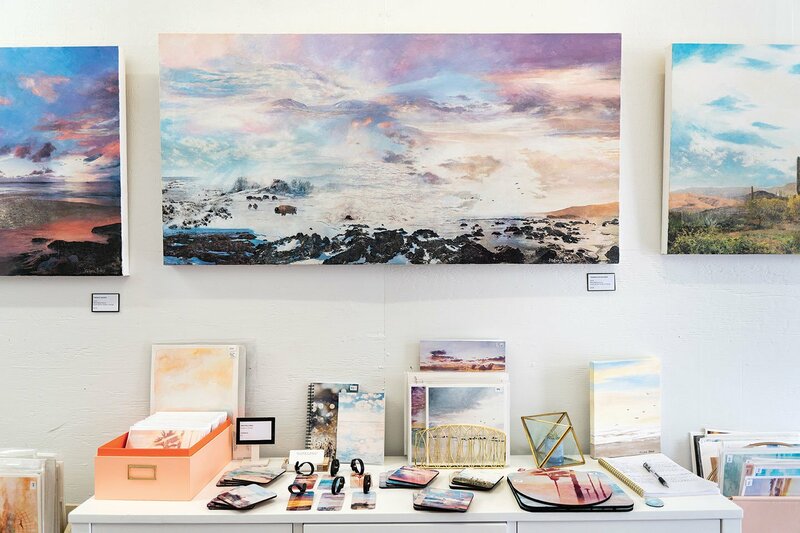 Inspired by the soft-focus Southern California sunlight, artist Stefanie Bales creates land- and seascapes that capture the pastel hues of the coastal region. 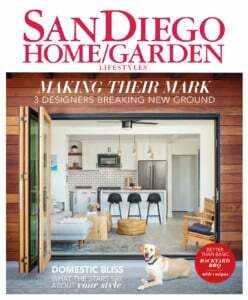 A sun-seeker who grew up in the suburbs of Philadelphia, she made her way to San Diego after college, driven by the desire to never again shovel snow from a driveway. Once here, she returned to school and earned her master’s degree in educational counseling, writing her thesis on art therapy and autism. 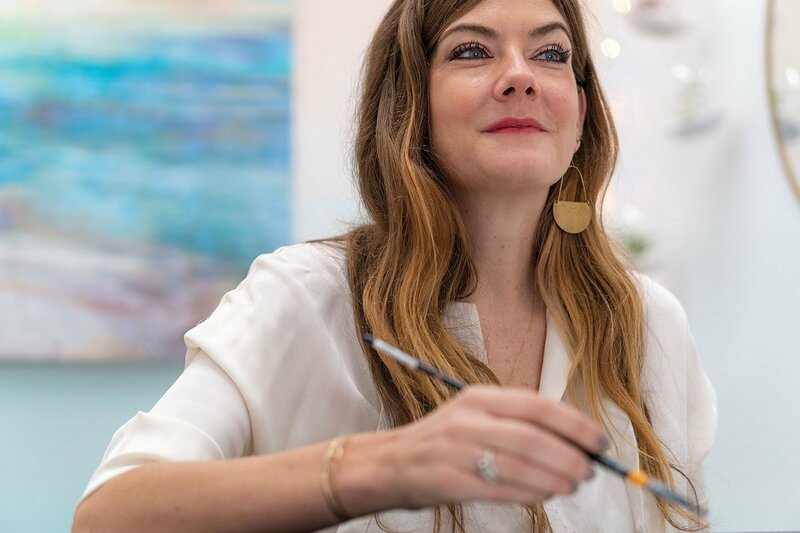 And while she didn’t end up a school counselor, she did find her way to the classroom, teaching various art classes at Platt College for more than a decade. 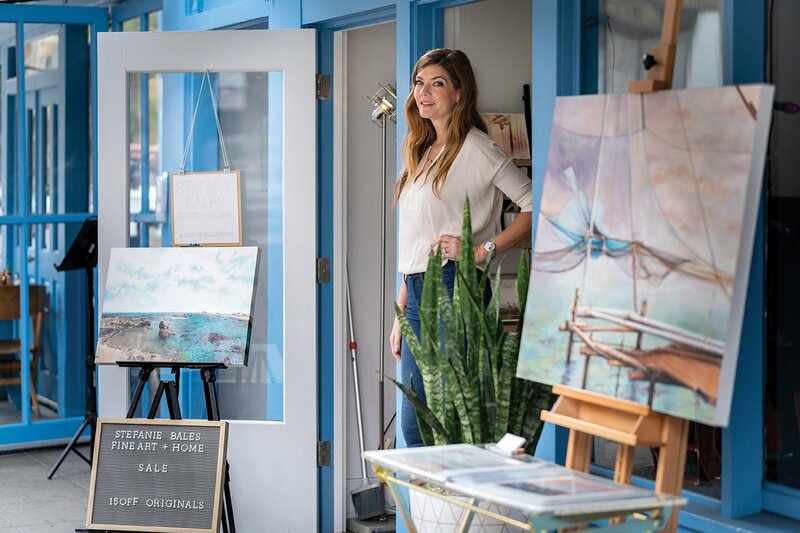 Last September she opened Stefanie Bales Fine Art gallery in Little Italy, the neighborhood she also calls home with her husband, Scott, and 4-year-old son, Weston. In a word: outside. “I’m especially inspired by the beach; by the colors, the interaction of the light and the water. It’s just the sun,” she says. Stefanie Bales at Frost Me. Photo by Brandi Schutt. Where do you dine out with the family? 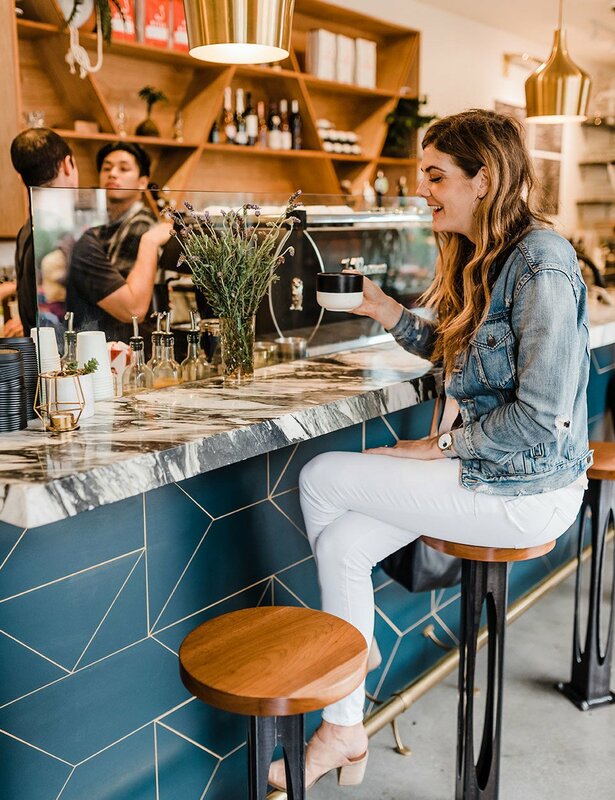 Every Saturday they convene at Little Italy’s Lofty Coffee Co. Cafe and Bakery. On Sundays the routine switches over to Frost Me Cafe & Bakery, opened by Audrey Hermes and Jon Parker, veterans (and victors) of the Food Network’s Cupcake Wars. How about for date night? If it’s an evening out with the hubby, it’s likely to end up at Shino Sushi, located in—you guessed it—Little Italy. 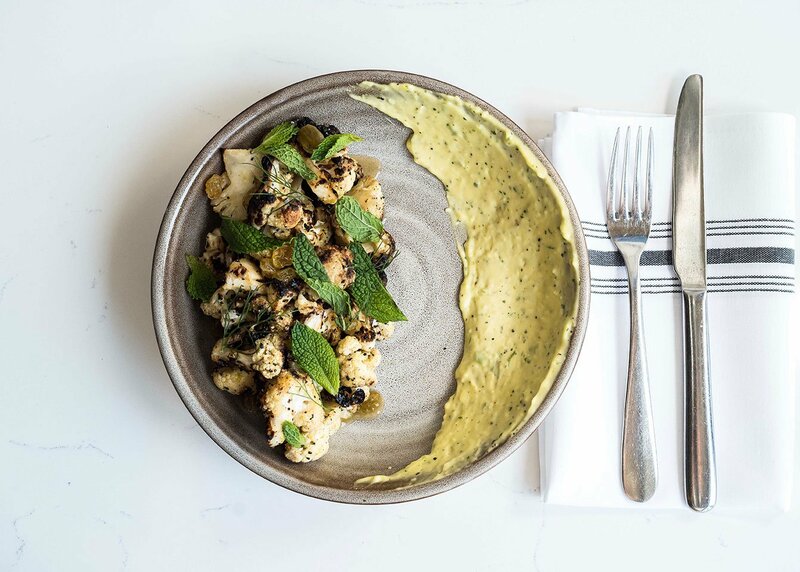 For a girls’ night out, though, Stefanie takes it to Hillcrest’s Trust restaurant, serving locally sourced, seasonal fare. How about a dose of culture? 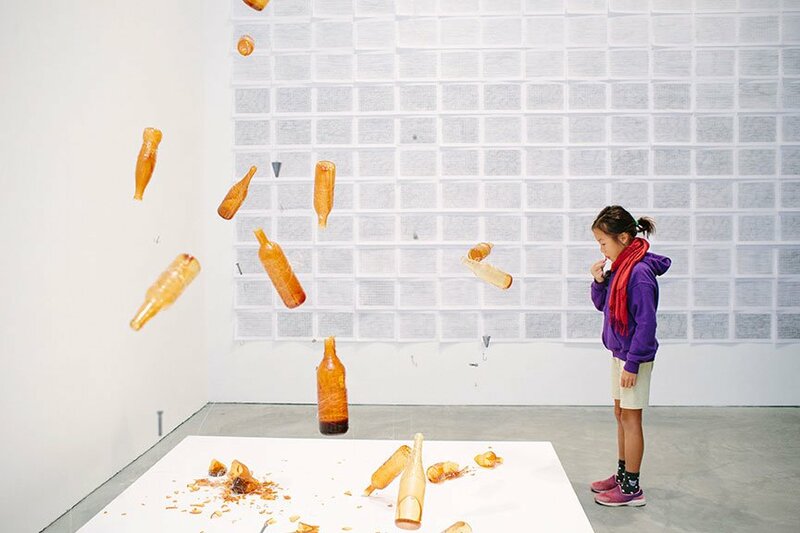 Photo courtesy of Museum of Contemporary Art San Diego. Baked goods. “I go to bed dreaming of them,” she says. “Everything!” she jokes. 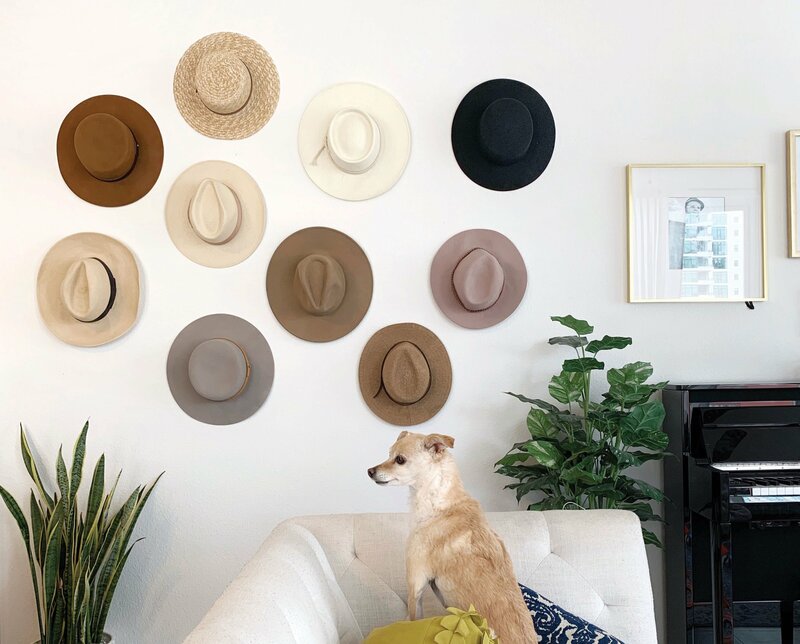 Her treasured collections include jewelry (“enough to have my own shop”), hats and books. “I have an exorbitant amount of books,” she says. Photo courtesy of Stefanie Bales. That would be a pair of red, Valentino rockstud pumps that were an anniversary gift from her husband. It should be noted this was not an easy choice for her—Stefanie is very into fashion. 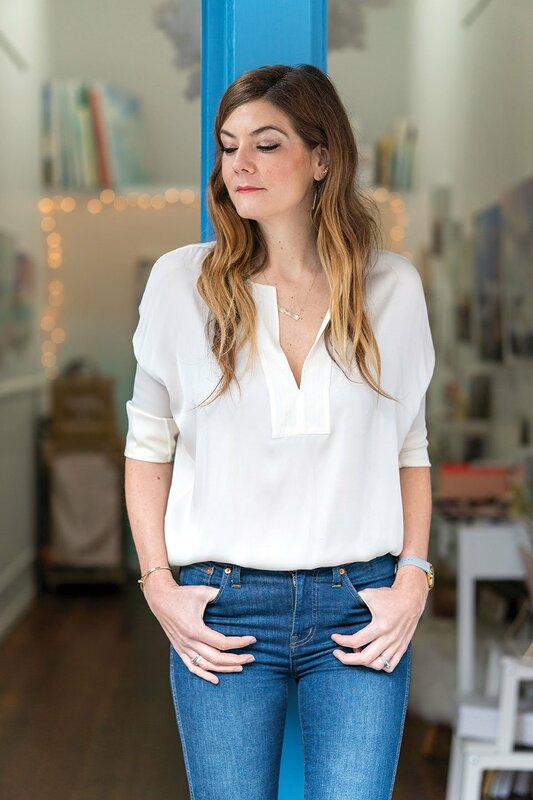 “Getting dressed is like painting on a blank canvas every day,” she says. What boutiques do you love? 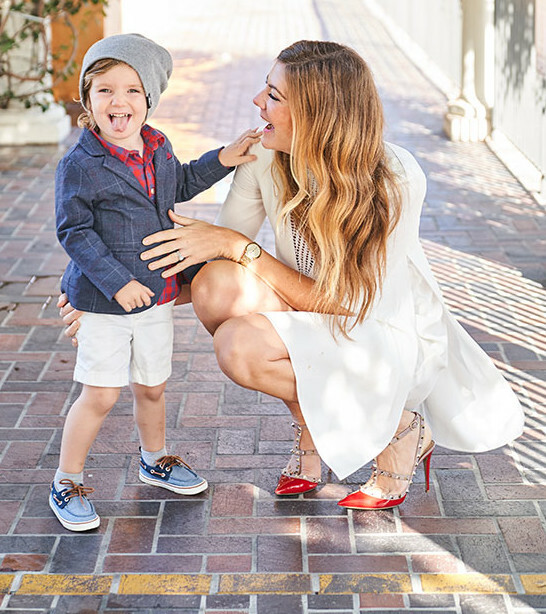 She likes to keep things local and gives a shout-out to Little Italy shops Vocabulary, featuring a chic collection of clothing, accessories and home decor, and Azzurra Capri, with its line of bespoke, Swarovski crystal-adorned sandals. So what book is on your nightstand? 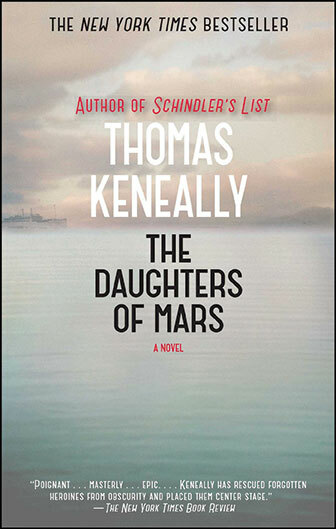 She’s about to sink her teeth into The Daughters of Mars by Thomas Keneally, author of the book that became the film Schindler’s List. Published in 2012, The Daughters of Mars tells the story of two Australian sisters who become nurses during World War I. The globetrotting Netflix sci-fi drama Sense8. Depending on her mood, her jams range from the electronic indie-rock of England’s Glass Animals to the alt-pop of Charlotte Gainsbourg. She also gives props to local duo Little Hurricane, with its stripped-down blues/rock sound. Where do you go for a weekend getaway? Thrift shopping in Palm Springs with her girlfriends is a top choice, as well as family trips to San Francisco and Cabo San Lucas. Who are your top fashion designers? French fashion houses Chloé and Yves Saint Laurent, as well as Stella McCartney, top her list.